55 Gallon XXXtractor 3 Bag System - FREE Shipping! The XXXTractor is a 55 gallon 3 ice bubble bag cold water herbal extraction system. It is a chemical free cold water extraction system used for the extraction of oil or trichomes and serves also as a trichomes separator. These oil filtration bags can extract trichomes from the surface of almost all plants. Add 1.5 kilos of dry plant matter. 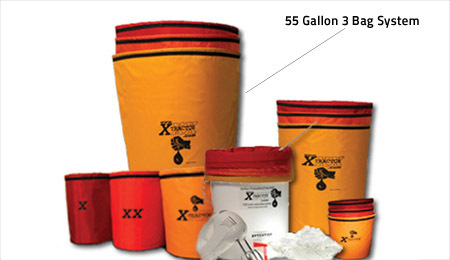 XXXTractor bags are fully assembled in Canada using the highest grade of durable waterproof nylon. The mesh is woven with high caliber module polyester yarn specially developed and engineered in Switzerland for industrial use.